In reality, I should be working on the baby blanket I’ve been hired to make, so I’ll keep this one short. For a few weeks now, a staple at my desk come lunchtime has been Dr. McDougall’s vegan instant soups. I first saw them at Holiday Market in Royal Oak and then saw them at Meijer for about $2.29 a pop. I wasn’t necessarily looking for vegan soups in particular, but just something healthier than the sodium-laden instant soups of yore. I tried a couple and really liked them. After I bumped into my co-worker, Mary, at the Meatout and learned she was vegan, I told her about the soups. Many of them you can buy for about $18 for a 12-pack on Amazon, so Mary and I went in on a few cases. It’s true — cases — but a $1.50 lunch is hard to come by so we went for it. Here’s the link to the whole lot that’s available on Amazon. They even are eligible for free shipping if you get 2 12-packs (or anything totaling $25 that’s eligible). Mary’s currently addicted to the Split Pea with Barley soup, and spends her time outside of work finding new and interesting ways to hide her vegan soups from her carnivore husband, Matt. My favorites are the Curry Brown and Wild Rice Fruited Pilaf (trust me — it just became available today and I can’t wait for my case to arrive because it’s hard to find in stores) and the Pad Thai Soup. So far, I can’t find one I don’t like at all though. It turns out Dr. McDougall’s also makes some breakfast type options, including oatmeal and barley featuring various fruits. If I can get past my morning peanut butter protein bar addiction, perhaps I’ll give them a shot. Dig in. A cheap lunch just got healthier. Vegans, I’m sorry. This blog just isn’t for you. It involves all the deliciousness that dairy can be. 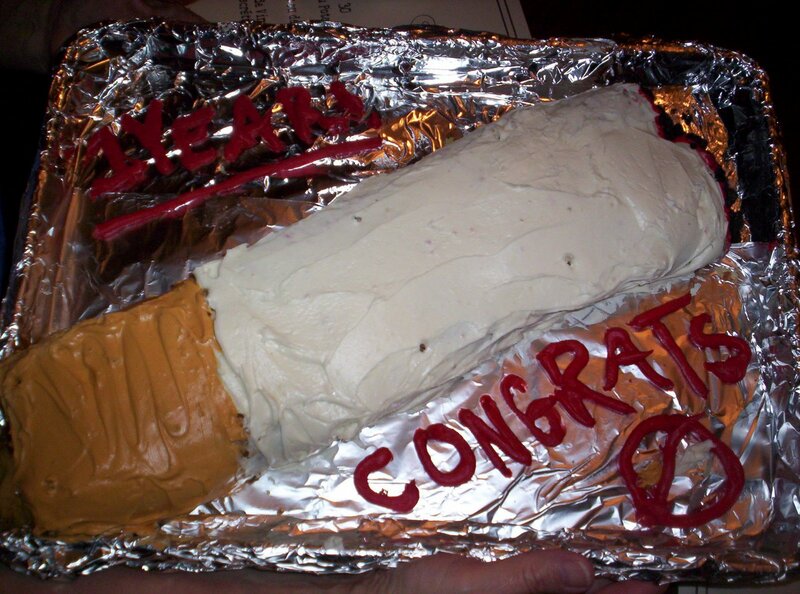 The first — the easy one, recipe wise — was a cigarette cake. Weird? Yeah, I guess so. But my mom smoked for a really long time. 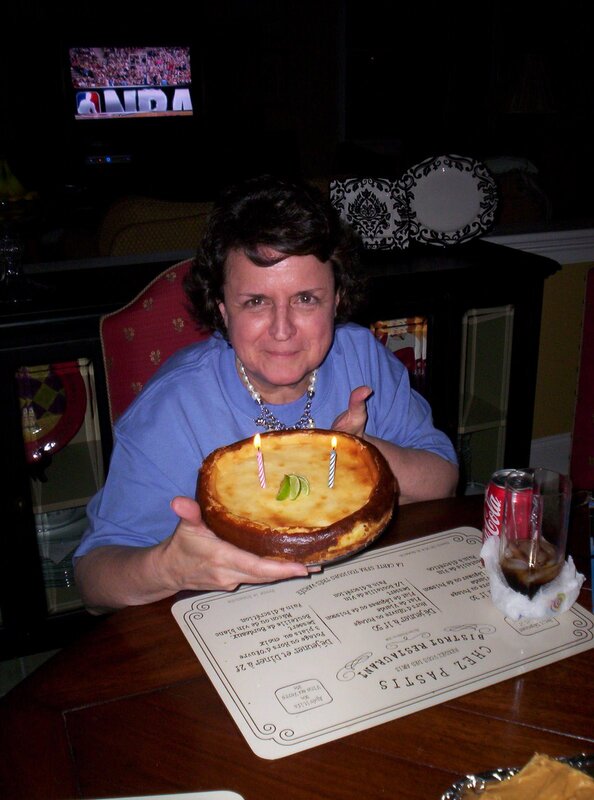 And she finally put down her Marlboro’s on her 59th birthday in 2007. So I thought making it a year without smokes, deserved a little recognition. I took a box of Betty Crocker Funfetti (or wait — is that Pillsbury?) anyway, funfetti cake mix, and made it according to directions in a 9×13 pan. Once it was cooled, I got it out of the pan the best I could (I had greased and floured the pan, which helped), and I used the entire length and about 2/3 of the width of the cake. For the majority of the cake, I used plain vanilla Betty Crocker frosting. For the filter, I mixed in a ton of yellow, a bit of red and exactly one drop of green food coloring. For the burning end, I used red food coloring to make a bright red frosting, then covered it in crushed Oreos to make the ashes. And that’s about it! I could have done better, but I think for my first shot out of the gate, it’s not bad! The “real” dessert I decided to make was a Key lime cheesecake. I’ve only made it once before and it was well received. So, when I learned my brother-in-law likes Key lime, I was in. Mix and press into the bottom of an 8″ springform pan. Bake for 5 minutes in a 350 degree oven. 5. Pour batter into crust and bake for 40-45 minutes. Be sure not to open the oven door at least for the first 35 minutes. 6. Once it passes the toothpick test (you prick it with a toothpick and it comes out clean) then you’re good to go. 7. Ideally, you’ll be able to let it cool completely and then refrigerate at least four hours before serving. But if not — who cares. It’s still going to taste freakin’ GOOD.